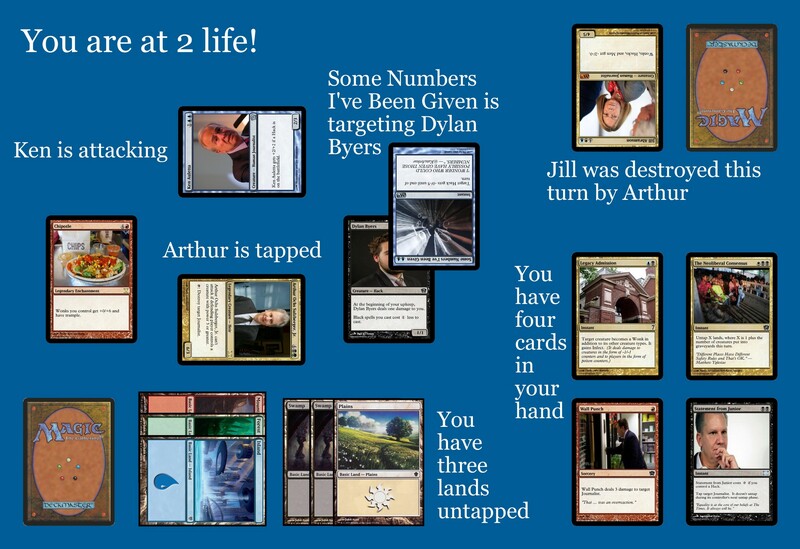 Can you stay alive until the next turn with the help of Dylan Byers? 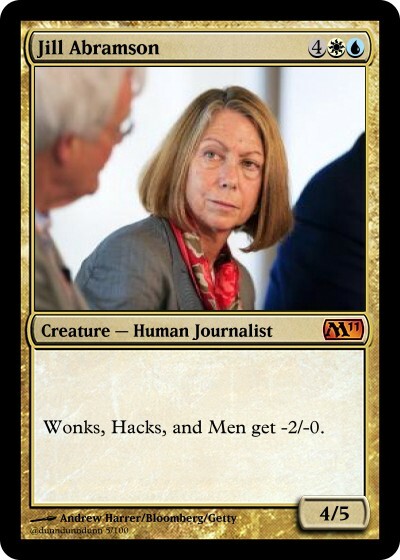 Jill Abramson. Costs 4WU. Creature — Human Journalist. 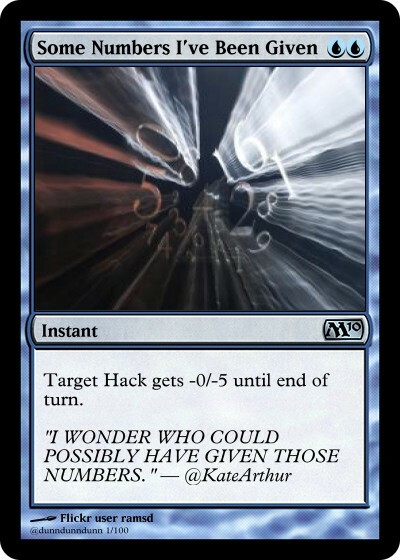 Wonks, Hacks, and Men get -2/-0. 4/5. 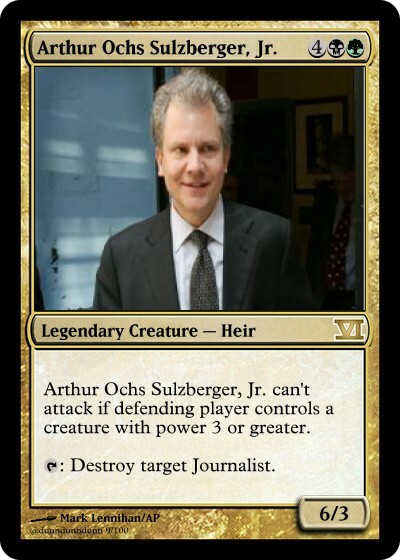 Arthur Ochs Sulzberger, Jr. Costs 4BG. Legendary Creature — Heir. Can’t attack if defending player controls a creature with power 3 or greater. Tap: Destroy target Journalist. 6/3. Ken Auletta. Costs 1UU. Creature — Human Journalist. 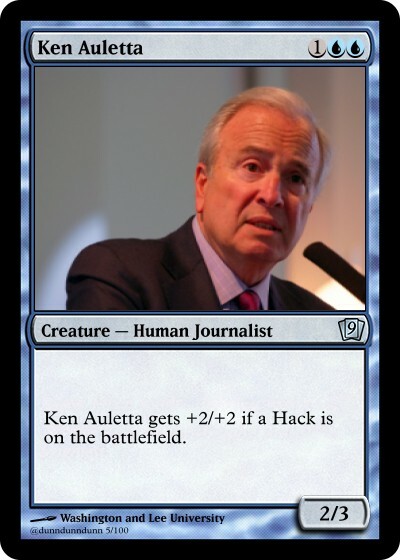 Ken Auletta gets +2/+2 if a Hack is on the battlefield. 2/3. Dylan Byers. Costs BBB. Creature — Hack. 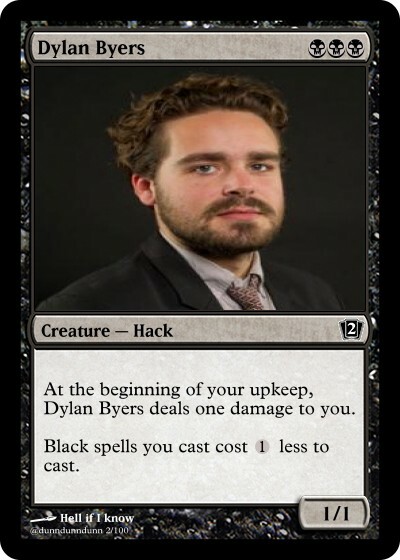 At the beginning of your upkeep, Dylan deals one damage to you. Black spells you cast cost 1 less. 1/1. You are at 2 life. You control Chipotle, Arthur (tapped), and Dylan. Your opponent controls Ken (attacking) and the spell Some Number’s I’ve Been Given, which is targeting Dylan. You have two untapped Swamps, an untapped Plains, and a tapped Mountain, Forest, and Island. You have four cards in your hand—Legacy Admission, The Neoliberal Consensus, Wall Punch, and Statement from Junior. You are in trouble! You only have 2 life remaining. It won’t take much to finish you off. It’s your opponent’s combat phase, and Ken Auletta is attacking you. Normally he’s got two power and three toughness, but since there’s a Hack (Dylan) in play, he gets +2/+2 and is a 4/5. Dylan has to block Ken in order for you to survive (remember, you’re at 2 life). But before you’ve been given the opportunity to throw Dylan in front of the rampaging Ken Auletta, your opponent cast Some Numbers I’ve Been Given, targeting Dylan! If this spell is successfully cast, Dylan will die and Ken will kill you! You have to act fast, before Some Numbers strikes Dylan down. The Neoliberal Consensus. WBB. Instant. Untap X lands, where X is 1 plus the number of creatures put into a graveyard this turn. Wall Punch. R. Sorcery. 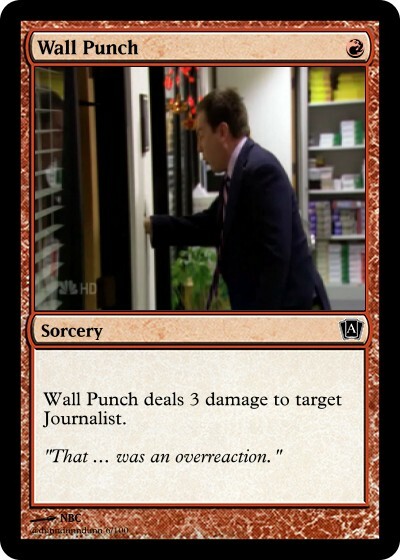 Wall Punch deals 3 damage to target Journalist. Statement From Junior. BB. Instant. 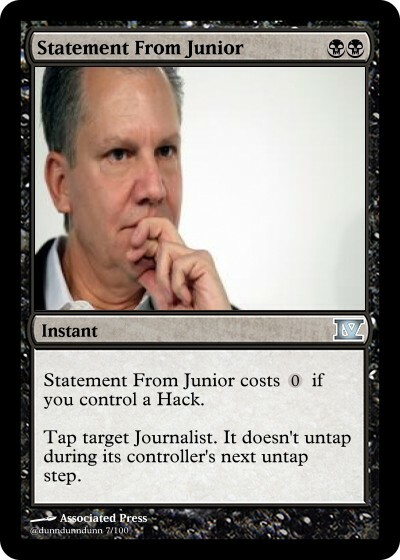 Statement From Junior costs 0 if you control a Hack. Tap target Journalist. It doesn’t untap during its controller’s next untap step. You have three lands which are untapped and available to use: two Swamps and and Island. So, how are you going to keep Ken from killing you this turn? Statement From Junior can’t stop Ken, because he’s already tapped and attacking. Wall Punch won’t work either, because it’s a Sorcery (meaning you have to wait until your turn to play it) and Ken’s grown too powerful due to Dylan’s presence on the battlefield. If you let Dylan die, Ken would shrink back to a 2/3, but that’s still enough to kill you—you’re only at 2 life. Make Dylan a Wonk, because he’ll then get +0/+6 due to Chipotle. Some Numbers I’ve Been Given won’t be able to kill him when he’s so strengthened, and he can block Ken and keep you alive for another turn. But you don’t have an untapped Island, and Legacy Admission requires blue mana. Remember that Arthur killed Jill this turn. That means you can play The Neoliberal Consensus, and untap two lands. Cast it, then untap a Swamp and and Island. Use those untapped lands to cast Legacy Admission on Dylan, making him a Wonk. 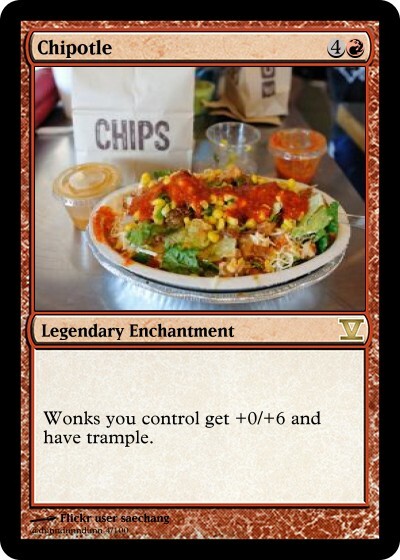 Dylan is now a 1/7 with trample, because Chipotle boosts all Wonks. Some Numbers I’ve Been Given reduces Dylan to a 1/2, but he’s still alive. Block Ken with Dylan. Dylan dies, but you remain alive at 2 life! Sure you’ll probably die next turn, but it’s not like we expected Dylan’s story to hold up very long anyway. Morgan Martin found another solution that I hadn’t even planned! Cast The Neoliberal Consensus to untap a Swamp and and Island. Let Some Numbers I’ve Been Given kill Dylan. Ken gives you four poison counters, but you need 10 to die, and you’re still at 2 life. You survive the turn! Morgan also pointed out that casting Statement From Junior on Ken is still a good idea: even if it won’t stop him from attacking you this turn, it will prevent him from untapping (and so being able to attack) during your opponent’s turn, buying you even more time.